of the Earth, these clouds will receive sunlight from below the horizon and reflect it to the ground, shining brightly well before dawn or after dusk. PSCs form at very low temperatures, below −78 °C. These temperatures can occur in the lower stratosphere in polar winter. In the Antarctic, temperatures below −88 °C frequently cause type II PSCs. Such low temperatures are rarer in the Arctic. Apart from arctic regions, PSCs have also been known to be seen in Scandinavia, Iceland, Alaska and Northern Canada. Sometimes, however, they occur as far south as England. quick to appear and disappear. Playback using the random shuffle mode of your CD player is highly recommended. “just another ambient CD”. Instead, we invite you to explore an alternative method of rendering ambience in a way that is more immediate, therefore effecting the listener’s mind in a more personal and powerful way. Nacreous Clouds is a depiction of forms that drape themselves in the winter across the skies of the polar North. These clouds get sunlight from below the horizon and reflect it to the ground, radiant before dawn or after dusk. 37 short tracks of iridescent ambience reflect their inner life, mercurial nature reflected in their evanescence. Sounds drawn from life (showers, running water, TV static, wind, cars, gravel streets) and instruments (cello, piano, bells) are formed into mellifluous mother-of-pearl tonalities. A mimesis of cloud motions in sound structures, filmy strata delicately unfurl, stretch and contract (see this sequence), mirroring their tendency to reveal the wind and waves of the stratosphere. Rawer than usual for this process-heavy pair, timbres are left exposed (what? no reverb?!) to shine through undimmed – more innocent, immediate. Possibly more affecting for this, Nacreous Clouds has the same pleasingly tranquillizing effect as cloudwatching. Mysterious, cloud formations take shape in Celer’s new ambient album. To start off, this album reminds me of one of Information’s old ambient recordings; their follow-up Successor which comprised 90-something bits and pieces with the simple instructions in the back to press random, then play, then sit back and enjoy. Such is the statement issued before-hand by Celer too regarding their album, Nacreous Clouds; their ambient journey plays just as well in sequence as jumbled up in random order, so naturally I was intrigued and have listened through in various orders in addition to the traditional track order. A little background on Celer first though; some may recall them as half of the force behind the Mesoscaphe album reviewed here at Soundscaping earlier in 2008 (ed. to which a highly anticipated follow-up is being worked upon). The duo is California-based husband and wife, Will Long and Danielle Baquet-Long; both teachers in education, the former also a published writer and instrumentalist into field recordings and sound experiments. The latter works in special education and music therapy, and is specialised in a multitude of disciplines as well as a seasoned globe-trotter from long stays abroad. Personalia aside, Nacreous Clouds delivers on both accounts; played chronologically and in random order, and is an absolutely sublime piece of ambient music. Will & Dani use sounds from piano, cello, bells, violins and field recordings and computers to process until the boundaries of each constituent instrument disappear and the result is just a lovely, floating stream of unassuming, non-pretentious sound. Soothing compositions of anything from half a minute and up to longer drones at five minutes all contribute to a holistic feeling of something serene and beautiful, like slowly developing clouds that form a shape then disperse and take on a different appearance, holding each shape for a limited time but all the while captivating to the listener, like the sky when you witness the phenomenon of mother of pearl clouds. The music is moving and restrained, sometimes growing in force then retracting, but never with elements that break the conformity of the entire composition. In this way, Celer have produced an indispensable collection of ambient soundscapes that flow seamlessly and would be ideal for home listening as a supplement to relaxation. If you are looking for an ambient album from 2008, look no further than Nacreous Clouds on the influential and/OAR label. Nacreous Clouds germinate in the polar winter of skies draped across Alaska, Iceland, Scandinavia, Northern Canada and, most notably, the Antarctic. Tokens of these rare cloud types, these mother of pearls, are wrung from household objects and natural instruments such as cello, violin, piano and bells on this, Celer’s first contribution to the and/Oar catalogue. In a space of seventy some odd minutes, thirty-seven small tracks appear – made up of processed tape loops – and are generally rigorous, moving and yet clear-eyed. The filmy sheets are delicately poised as they curl and uncurl, stretch and contract, almost mimicking the way in which these clouds tend to reveal the wind and the waves of the stratosphere. Perhaps not surprisingly, the speed of the pieces changes like small spasms and the odd work ascends higher or lower than the majority of others. During tracks like “Swarms Of Orange” and “Seeing; That Side Of Teaching”, furthermore, there is noticeable emphasis on vivid and slowly shifting iridescent colors. It’s real music for synaesthetes, for whom the hue of a note or chord is not a metaphorical device but an objective fact. Sans reverb and other such processing techniques, these pieces manage to strike at the emotional registers with some immediacy. Trentasette micro frammenti lunghi poco meno o poco più di 2-3 minuti sintetizzano il simbiotico unisono della coppia Danielle Bagìquet-Long / Will Long, in arte Celer.Dichiarate propensioni ambient che in Nacreous clouds trovano spunto per far dialogare elementi atmosferici in matrici elettroacustiche. Parliamo delle nubi madreperlacee, fenomeno noto nelle regioni artiche, legato alle rigide temperature invernali che si raggiungono nella stratosfera polare ad altitudini di 15,000–25,000 metri.A causa dell’altitudine e della curvature della superficie terrestre queste nubi ricevono la luce del sole al di sotto dell’orizzonte per poi rifletterlo sulla Terra. S’incontrano tracce d’un malinconico naturalisno romantico, che prendono consistenza nelle vaporee identità tonali di improvvisi lamenti elettrostatici.Paradigmi d’eccellente sensibilità intrappolano l’atmosfera percettiva delle sfumature madreperlacee che diventano motivo di dibattito su tematiche tanto care alla musica minimale del dopoguerra. Se volessimo parlare di influenze citeremmo i musicisti-scenziati alla Toshiya Tsunoda, la ricerca sulle ombre sonore, il concetto di “ecologia-sonora”, “musica invisibile”, senza dimenticare gli studi ormai classici legati al periodo post-werbiano del puntualismo, o le contemporanee affinità di Mark Fell. Ma non è questo il punto. Piuttosto stupisce l’organica architettura di fondo che trama per 78 minuti celando fonti analogiche e digitali abilmente plasmate in laptop, tagli, filtri e field-recording senza perdere di vista il filo conduttore.Quel filo conduttore che si fa portavoce d’estetiche e organiche letture ambientali, rappresentando al meglio la mutevole identità di una nuvola e dei suoi fondali in colore.Una delle migliori opere del duo, sicuramente un raro esempio di poesia sonora. La música de Celer me hace pensar, observar la naturaleza que, en este caso es un austero jardín. El sol pronto se va a disipar entre los edificios de Santiago… Los loops fluyen en la atmósfera uniendo sonidos analógicos y digitales, como si fueran ondas que van y vienen. Es el paisaje sonoro perfecto para ver o imaginar las nacaradas nubes que son un fenómeno que se da en el invierno polar, especialmente en el Antártico, en donde se experimentan temperaturas de 78° grados bajo cero. Estos drones sonoros fueran hechos originalmente por un cello, violín, piano y campanillas además de registros de campo, cuyos sonidos son puestos en cintas que son tocadas al unísono y luego procesadas por el laptop. Celer está compuesto por Will Thomas Long y Danielle Baquet-Long, ambos escritores y educadores quienes residen en el norte de California. “Nacreous clouds” is just another definition for “Polar stratospheric clouds” or PSCs, whose abnormal shining occurs before dawn or after dusk due to the sunlight received from beyond the horizon, a luminosity that is also reflected to the ground in those circumstances. To sonically represent this phenomenon, Will Thomas Long and Dani Baquet-Long recorded several segments of music and human activity, either by playing regular instruments (cello, violin, piano and bells) or aptly described “household sounds” (water, TV static, etc.) together with “classic” field recordings. Afterwards, they made tape loops of the whole, setting the playback at various speeds in different combinations, the results processed by laptops and “channelled back out into a Kaiser filter”. If you think that it’s possible to detect even a slight particle of the above mentioned sources while listening to this CD you’re completely wrong, as the 37 pieces forming this malleable architecture – improvable by shuffling the tracks according to the composers – are short glimpses of a state of conscious stupor that renders this work, in all probability, the best Celer album I’ve had the opportunity to enjoy. The “raw iridescent ambience” depiction used in the press release is a good one: umbrageous entities, whispered amorphousness, sudden disappearances and somnolent reminiscences are all part of a same mental condition, the nerves receiving a much needed rubdown that transforms a latent tenseness into a resinous melancholy. Goodbye to vigilance, welcome to inside responsiveness. A fine paradigm of contemporary ambient at low volume, but also an exciting titillation of particular frequencies as the mixture is left free to reveal its stifled resonances more deliberately. Two is a good number in art. When things happen in two, then you can be assured that some sort of order will be inherent in the system, and that change will happen. I have worked with and befriended a number of creative twosomes, but none so talented and well presented as Will Thomas Long and Danielle Baquet-Long. Their self described sound, visual, literary, and artistic endeavor working under the moniker ‘Celer’ is making waves in the ambient music scene. I remember the first night that I heard the music of Celer. It was early in the summer of 2007, in the mission district of San Francisco, and I came across their Archaic Horizon release ‘Arriil’. Slightly inebriated, I sat transfixed as the sound, a single line gradually unfolded like a Rosicrucian flower into a dense world of sonic variation. It was as if I had come across a new aesthetic raison d’être. Admittedly, that night changed the course of my musical life, taking me in a powerful new direction away from noise, towards a music of stillness, beauty and romanticism. Recently Will and Dani mailed a copy of their newly released album ‘Nacreous Clouds’, a piece that I had listened to with great delight over the course of the last year in MP3 format. Of all their work, this album, beautifully released on Dale Lloyd’s influential and/OAR label, and its sister album, the self-released ‘Neon’, are cornerstone pieces of a new aesthetic voice in experimental and ambient music. Like the rare polar stratospheric clouds which inspire this work, this piece fades into the lexicon of music that is hardly noticed, but exists in such great beauty that those who come across it are left in awe at its subtle glow. Somehow I feel that this is me in the wake of this powerful music. Married couple and alchemists extraordinaire Danielle Baquet-Long and Will Long (aka Celer) repeatedly demonstrate the uncanny ability to take virtually any source material and spin it into aural gold. The duo’s and/OAR release Nacreous Clouds, for instance, presents seventy-eight minutes of thirty-seven miniatures (the longest four minutes, the shortest an 8.5 second-long voice sample that’s jarring for being so unexpected and incongruous) that aspire to capture the “hyper-temporal nature” of said clouds which are distinguished from other clouds in a couple of key respects: nacreous clouds—also known as polar stratospheric clouds (PSCs)—reside in the winter polar stratosphere at altitudes of 15,000–25,000 metres (50,000–80,000 ft.) and, due to their high altitude and the curvature of the Earth’s surface of the, receive sunlight from below the horizon and reflect it to the ground, shining brightly well before dawn or after dusk. The production method adopted by the group is pure Celer: the partners first recorded themselves playing cello, violin, piano and bells, supplemented that material with field recordings (showers, sink water, television static, wind, car noises, etc. ), and generated tape loops from selected bits which were then arranged into patterns and speeds that would resemble the clouds and their movements. The coup de grace(? ): “When mixing the loops, (they) played three to six of them at a time, on different reel-to-reel tape players connected to both of (their) laptops and channeled back out into a Kaiser filter.” Finally, Celer opted to leave the resultant material in a “raw” state by not enhancing the tracks with reverb, a move that imbues the material with a pristine purity. Adding to that quality is the fact that, though a rich range of source elements was used to produce them, the resultant material has been cleansed of identifiably associative characteristics and, consequently, each iridescent, quietly shimmering piece, reduced to its purest essence, floats peacefully through the stereo field, coming into view quickly and disappearing just as fast. In general, the mood is tranquil and the cumulative effect calming, even if some “clouds” drift more quietly than others. If ever a recording was tailor-made for random shuffle, it’s Nacreous Clouds—even titling the tracks vividly as Celer has done (e.g., “Passing Hills and Still Windmills,” “Voiceless Devilfish”) seems an extravagance when they could just as reasonably be named “Nacreous Clouds I,” “Nacreous Clouds II,” and so on. The recording, like virtually all of Celer’s output, invites immersion and promotes the experience of temporal suspension. An utterly enchanting release from and/OAR which sees the husband and wife team of Dani Baquet-Long and Will long delivering what can only be called a magical series of ambient works. Using a wide range of original sound recordings including live instruments and environmental sounds the tracks are then built up using layering and filtering to create the dream-like, drifting final pieces. Meant to be an aural representation of the nacreous clouds from the title there’s a loving and gentle touch here and it’s interesting that the final product features lots of shorter tracks rather than the more standard three of four long ones. I for one believe it works exactly as intended and to experience the entire CD in one 78 minute sitting is the best way to enjoy it. Warm, yet distant and full of natural sounding beauty this is a release to treasure. Highly recommended. Celer is the husband and wife team of Dani Baquet-Long and Will Long, who currently reside somewhere down on the Southern California coast. They’ve released a handful of well-received ambient recordings on Spekk and Infraction, and they’ve found a good home on and/OAR for this driftscape of tapeloop interplay. As for the title, a nacreous cloud is found in the upper regions of the atmosphere at the polar regions. 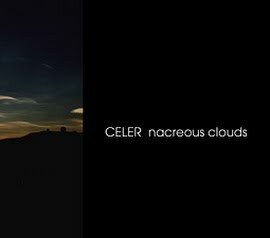 Well past sunset and well before sunrise, these clouds showcase a radiant brightness against an otherwise darkened sky; and it’s this particular phenomenon that forms the inspiration for Celer’s album of the same name. Having stretched the tones of various instruments into languid looping drones and bliss-out ambience, Celer presents 37 short tracks which actually work really well as a single composition, given the gentle flutter and restrained attack from all of their sounds. References abound to William Basinski’s ambient work, Aidan Baker’s soft focus facets, and of course the seminal work of Brian Eno. Highly ambient loops are created to make the music. It’s played by cello, violin, piano, bells but also household sounds, the wind, walking gravel streets and such like, but if you wouldn’t know this, you could as easily mistake this for a bunch of slow arpeggio’s played on an analogue synthesizer. But it’s not. Celer created loops of everything and playing three to six on their reel-to-reel recorders, ‘connected to both our laptops and channeled back out into a Kaiser filter’, they say. Perhaps the ‘Kaiser filter’ makes that these thirty- seven (!!) tracks sound quite similar with sonic differences to be spotted through a microscope. It moves like the clouds, like those mentioned in the title, which occur in winter time. Not entirely winter time here (will it ever be again?) yet, and not many clouds on a beautiful autumn day (my kind of weather), but if I would open up a window things would certainly get chilly in here, and this could be a great sound track. Beautiful examples of somewhat darker ambient music.